Since the Solemnity of the Epiphany, 2002, the Church has been made aware of unspeakable harm to young people by the sexual misconduct of clergy and religious. We have since employed the services of Praesidium, Inc. to assist us in responding to the victims of sexual abuse with informed pastoral care, which may include psychotherapy and spiritual direction. Praesidium, Inc. has helped us develop parameters for our ministry to minors to ensure, as far as possible, that young people are safely in our care. Furthermore, Praesidium, Inc. has given us direction for having in place guidelines for the supervision and care of any members of our Province accused of sexual abuse. Praesidium, Inc. or a similar professional investigative agency may be employed to conduct investigations of allegations to ascertain their credibility. More detailed information will be found in our current manual of Policies and Procedures, Volume V, Maintaining Ethical Ministry with Minors and Adults. At this time we are prepared to report that each member of the Province has been cleared by a criminal background check. We have joined with other religious communities in the Conference of Major Superiors of Men (C.M.S.M.) to participate in a program designed by Praesidium, Inc. called Instruments of Hope and Healing. This program has led us through the many steps required to have our Province accredited by Praesidium, Inc.
Praesidium, Inc. on June 4, 2009 granted full accreditation to the Province for its policies and practices for the protection of young people. The accreditation must be renewed every three years. Supervision of any member of the Province who may need it. The Province is re-certified its accreditation in 2013; it is accredited through 2016. We have set up a review board to consider matters related to the protection of young people and to be an independent source of advice on these matters. Every community of the Province has held at least one community meeting to review and discuss the above cited manual, Maintaining Ethical Ministry with Minors and Adults. Every friar in active ministry has been certified by participation in the Virtus program or through conferences held by Praesidium, Inc. Nearly every friar has participated since 2009 in a minimum of three hours of continuing education programs in order to remain up to date. Each of us understands what pedophilia is, how to recognize signs of this abuse, and the particular harm to minors resulting from the sexual misconduct of a priest or religious. We are profoundly humbled and sorrowed over the harm any minors have suffered as victims of sexual abuse. We apologize to them with personal chagrin and sincerity. We also recognize and admire the courage of those victims who have come forward and called us to respond with compassion and understanding to this critical issue of our ministry to young people. We encourage any victims of sexual abuse to come forward and find us willing to address their needs with a pastoral response. As a Province, we were committed to a coordinated effort among several religious communities to respond to any allegation of sexual misconduct through an organization called Pathways to Hope. After Pathways to Hope was dissolved in 2011, the Province developed its own response team. Originally approved by the Prior Provincial and the Province Council May 6, 2005. Subsequently updated. the trust placed in them. 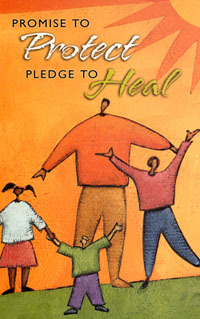 A Prayer for Healing for Victims of Abuse and accompanying graphic, Copyright © 2004, United States Conference of Catholic Bishops. All rights reserved. Used with permission. To contact the Office of Victim Assistance of the Archdiocese of Chicago, phone 312-751-8267.